Knitters use intarsia to “paint” with stitches. Projects can range from intricate portraits to bold geometrics to distinctive plaids and florals to simple color blocks. Although the graphic elements appear to be stamped on the fabric, the patterns are knitted in as you go. Unlike stranded knitting, intarsia does not have yarn floats across the wrong side, so there’s no worry about keeping tension even or avoiding puckering. Instead, each section of color has its own yarn supply. Regardless of the number of colors involved, intarsia is much easier to knit than it looks. After all, it’s just basic stockinette stitch! To see the full, print version of this article, get a copy of knitscene Summer 2018! 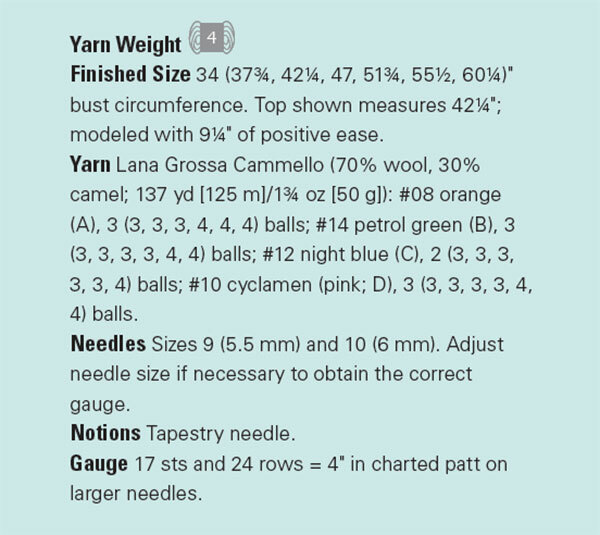 Some areas will be large enough to require a full ball of yarn; others will be smaller and can use partial balls. Some knitters like to use store-bought bobbins for each yarn supply unit; others prefer self-made yarn butterflies. I actually use simple one-yard lengths of yarn, which are easy to untangle when necessary. If my yarn supply for one segment runs out, I just add another length. 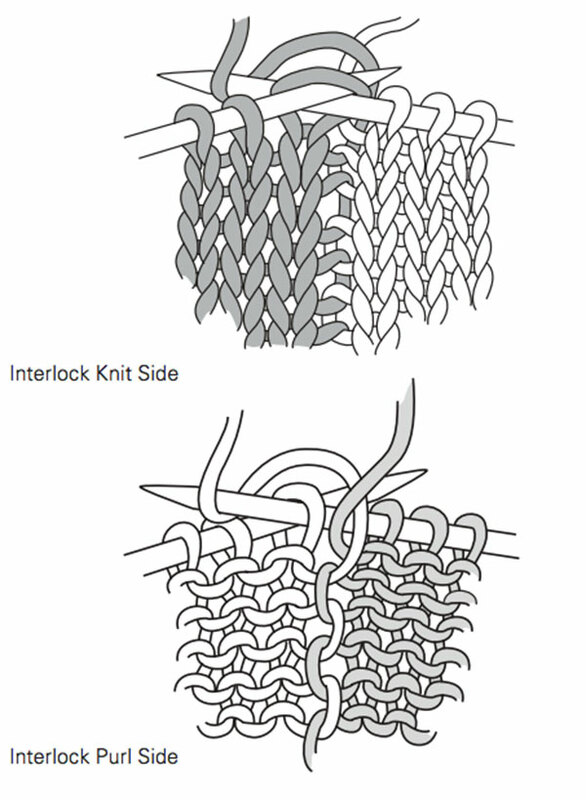 The most important thing to remember about intarsia is that the yarns must be interlocked every time they meet. Interlocking the yarns is surprisingly easy, and the technique is identical on both right- and wrong-side rows. Here’s how the technique is worked: you drop the color you’ve been using to the left of the new one, then pick up the new yarn from underneath the previous one, bring it over the previous one, and just start knitting (or purling). 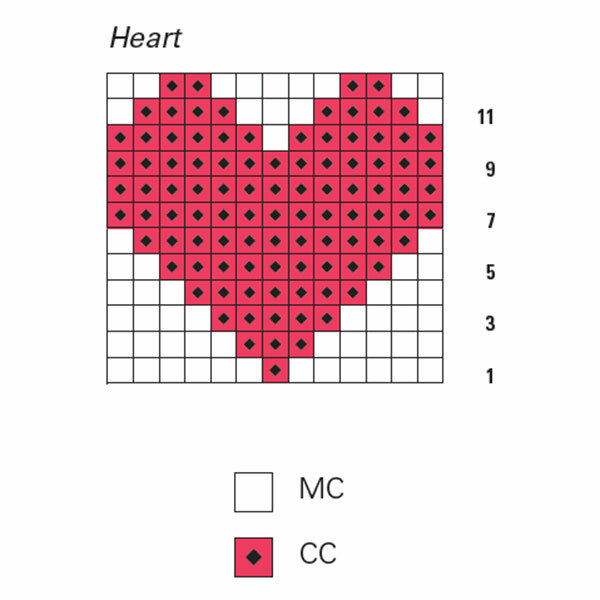 For extremely tiny areas of a color (with fewer than five stitches across in any direction) such as at the top of the heart in the chart, many knitters prefer to embroider the new color on top of the knitted fabric to avoid having one more yarn in a row. 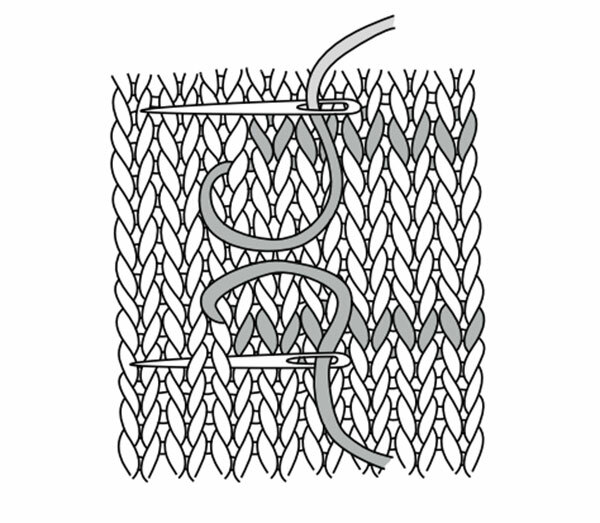 This technique, called duplicate stitch (or Swiss embroidery), is ideal for adding narrow diagonal lines in an argyle pattern or whenever you’re adding isolated stitches of a color. 1. Using a tapestry needle, bring the yarn up through the center of the stitch just below the one you wish to cover. 2. Insert the needle from front to back to front, working from right to left, under both loops that create the “V” of the stitch in the row above. 3. Insert the needle back into the same spot in the stitch below. 4. Bring the needle back up to the right side of the fabric through the center of the adjacent stitch to the left. 1. Using a tapestry needle, bring the yarn up through the center of the stitch you wish to cover. 2. Insert the needle from front to back to front, working from right to left, under the two loops that make the “V” of the stitch in the row above. 4. To cover the next stitch in the vertical column, bring the needle back up to the right side of the fabric through the center of the stitch just worked. 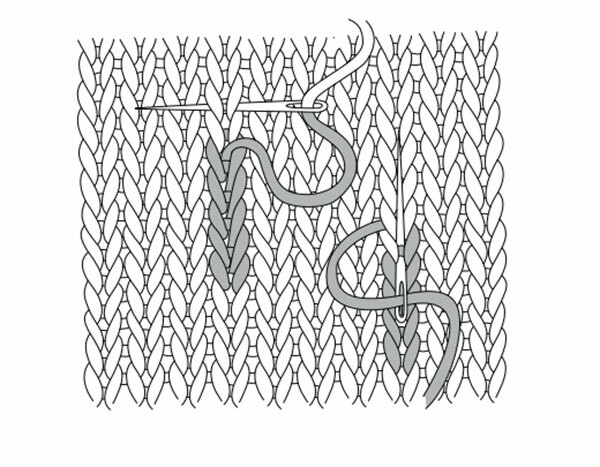 Intarsia can result in myriad yarn tails that must be woven in. The easiest—and fastest—way to manage them is to deal with them as you knit. It is best to weave tails in to a subsequent row using the same color. Doing so will keep the tails invisible on the right side of the fabric. Yarn tails from the final use of a color must be worked into the following row, even though that row will be in a different color. The method for weaving in yarn tails as you go is different depending on how you hold the yarns as you knit. In all cases, the tail is held in the nonworking hand (the left hand for American “throwers” and the right hand for Continental “pickers”). 1. Bring the tail under the working yarn as you knit (or purl) the next stitch. 2. For the subsequent stitch, bring the old yarn tail over the working yarn as you knit (or purl). 3. Continue in this fashion, alternately bringing the tail over and under the working yarn on the wrong side of the fabric for about 2″ (5 cm). 4. Snip the tail, leaving a ó” (1.3 cm) tail. Easy! 1. Work the first stitch normally. 2. For the second stitch, insert the right needle into the stitch as usual, and, before working the stitch, bring the yarn tail over the working yarn and around the right needle tip counterclockwise. 3. Wrap the working yarn around the needle as usual, then unwrap the tail back to its original position and finish the stitch the typical way (by transferring it to the right needle). 4. Continue in this manner for about 2″ (5 cm), alternating working one stitch without wrapping the tail and one stitch wrapping the tail. 5. Snip the tail, leaving a ½” (1.3 cm) tail. How’s that for a time-saver? Each color change has its own length of yarn. 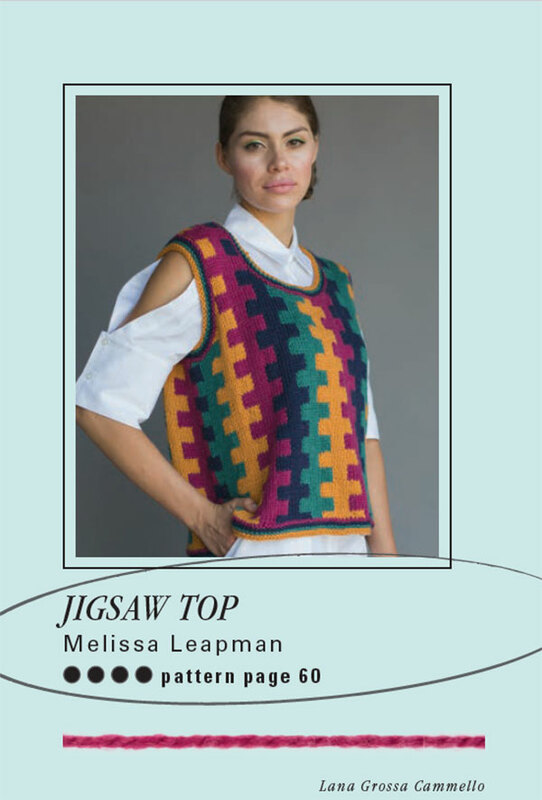 Melissa Leapman is a knitwear designer in New York City. 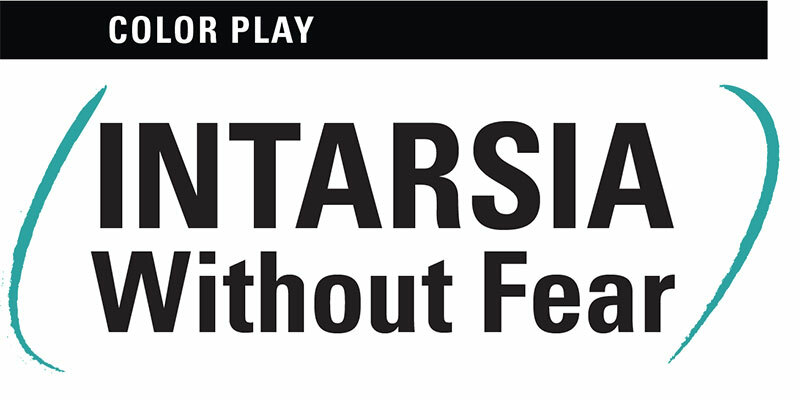 This piece on intarsia was originally published in knitscene Summer 2018. 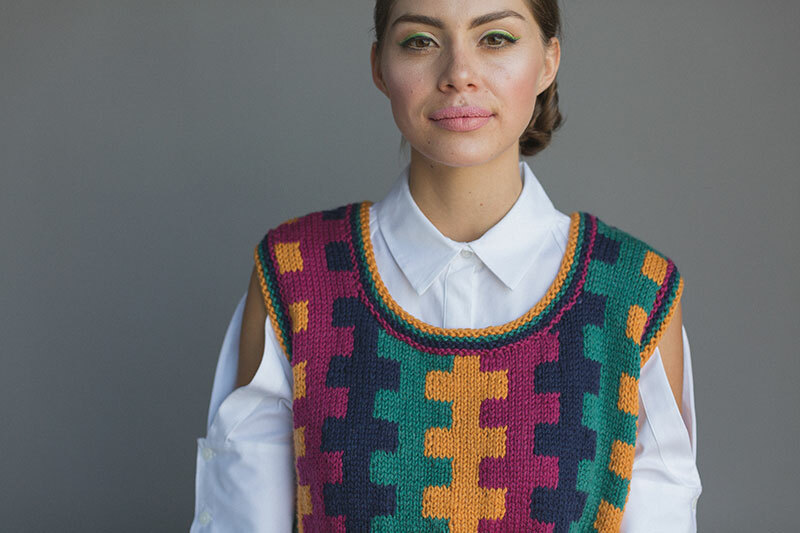 Dig into intarsia with knitscene!